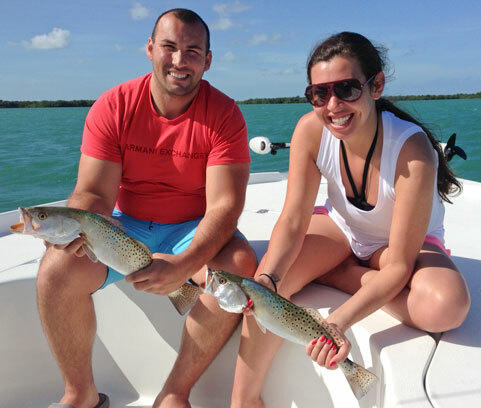 January fishing is setting up nicely in Key West. Now that the new year is officially underway we can look forward to getting back to the business of fishing here in Key West. We have had a banner weekend in the backcountry with a decent weekend offshore. Out back the flats and backcountry have been very good in spite of a pretty stiff Easterly breeze just about every day. Last report I mentioned tarpon fishing. Well it was “ok” with a few fish caught we could definitely tell that it was a mid winter anomaly. I suspect February will be the beginning of our late winter consistent tarpon fishing. Not to fret the fishing has been amazing everywhere else. The flats have been solid with permit on the deck tailing it up. Along side them are the rays with the possibility of Jacks and Cobia following them like lost puppies. Many cobia and jacks come in out of the Gulf Of Mexico tailing the Sharks and large rays looking for a free meal. Also on the flats we have ben fortunate enough to be getting into some nice redfish as well to the 6 lb range. The trout this year have come in large supply and that did not end this weekend. We have been getting into the 22-28 inch trout pretty regular out back along with some nice pompano and snappers. All told with the other fun fish we are into an angler could feasibly catch his weight in fish on a four hour trip. Blackfin Tuna is the word of the week offshore. Many fish are stacked up on the deep water wrecks just south of Key West waiting for a handful of white bait to be thrown at them. Our tuna have been running nice sized this year with fish up to 28lbs. Along the reef the kingfish are making for nice fast runs and lighting up the water. We use super light tackle on both of these fish to make it more fun for our anglers. On the reef as well the yellowtail snapper bite has been very good as well with anglers catching limit regularly on 4 and 6 hour trips. Cero mackerel are also a fish to be reckoned with as they are running 8-10lbs. One of the better tasting Mackerel in my opinion. The winter has always been my favorite time to fish Key West with the weather, the numbers of fish we have here in the cooler months and of course this is when people want to be here to get out of the snow. January is a busy month for us here at Dream Catcher Charters but we still have some room left in our schedule and offering some discounts as well. The best thing to do is just give us a call for an up to the minute fishing report or to book a trip with us or any of the great fishing guides in Key West. From the shallowest flats to the deep sea Dream Catcher Charters covers it all. With state of the art boats built by Yellowfin Yachts and powered by Mercury Marine we use nothing but the best in equipment from DAIWA, Orvis, Owner Hooks, Fins Braid, MirrorLure and AFTCO. Images and Copy are property of Dream Catcher Charters.